How do you market misunderstood wine? That was the question posed at two otherwise very different wine industry symposia that Sue and I attended in recent weeks. Although neither meeting arrived at a definitive solution, I think I begin to see the outline of an answer as I compare the two situations and start to connect the dots. The first gathering took place amid barrels and cases of wine in the cellar room of Oak Knoll winery near Hillsboro, Oregon. 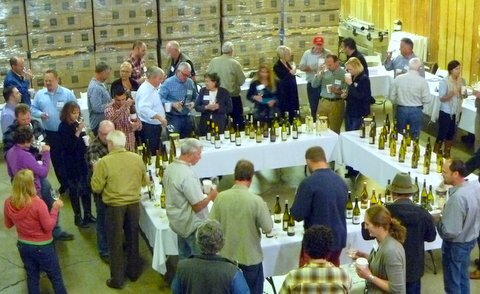 The common thread that united the small group that assembled was Oregon Pinot Gris. The first Pinot Gris vines in the United States were planted by David Lett at The Eyrie Vineyard, so Oregon has a legitimate claim to this wine, which is hugely popular in its Italian Pinot Grigio identity, but still not as widely embraced when presented as Alsace- or Oregon-style Pinot Gris. The wines themselves can be wonderful and distinctive and Jo Diaz is helping to organize a movement to make Pinot Gris Oregon’s signature white wine (to complement Pinot Noir, the signature red). But there are problems to overcome. The first is consistent quality, which is obviously key. Oregon Pioneer David Adelsheim told the group that the variability in quality, which was once shockingly high, is now thankfully reduced. Although there may not be a distinctive “Oregon style” there is far more consistent quality. Good news. Perhaps because of this quality, the wines sell very well. When Paul Gregutt asked the wine makers if they sell out of Pinot Gris, a great many hands were raised. Much of this action is in the tasting room and it seems that tasting is believing. They come for the Pinot Noir, but when they taste the Gris (at half the price of the Noir and sometimes less), they walk out clutching bottles. Sounds like a success story. But that’s also the problem, too, Adelsheim noted. Pinot Gris sells very well in the $15 to $20 price range, but there are precious few PGs that break though the $20 glass ceiling. My calculations (based on very limited data) suggest that a $15 Oregon Pinot Gris is not hugely profitable when sold directly and less so when sold into the 3-tier system at a discount. Low profitability puts a glass ceiling on quality, according to some of the winemakers present, who believe that additional research and investment in viticultural and winemaking practices could make Oregon PG as great in its own way as Oregon Pinot Noir. Consumers misunderstand Pinot Gris — or maybe I should say they misunderappreciate it (if that is indeed a word). They love it, but they don’t appreciate its quality (maybe it is the Pinot Grigio curse?) and won’t pay prices that would power the category to new heights. That’s what we heard in the Oak Knoll barrel room. What is to be done? Winemakers (and their wines) came from seven U.S. states (Washington, Oregon, California, Idaho, Michigan, New York and New Jersey) and seven countries (Germany, Austria, Slovakia, Australia, New Zealand, Canada and the United States) . France was missing in action (Planet Riesling sans Alsace? Incroyable! ), but they made a big appearance at the last Rendezvous three years ago and so perhaps can be given a pass this time. 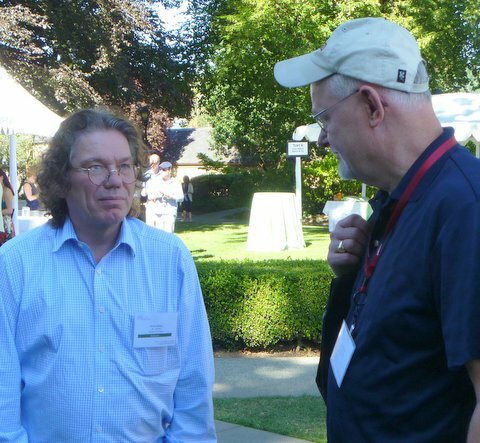 Riesling Rendezvous is organized by Washington State’s Chateau Ste Michelle, the world’s largest producer of Riesling wines, and Germany’s Dr Loosen. Ernst Loosen is perhaps the world’s foremost, most enthusiastic and hardest-working proponent of Riesling. And he makes some damn good ones, too. So what’s the problem with Riesling? Well the issue, which has been discussed at each of the four meetings of this group, is that most consumers misunderstand the wine and the issue is usually sweetness. Riesling is fascinating because it comes in such a vast array of styles — I almost run out of dimensions when I try to explain all the aspects of Riesling, but sweetness seems to be the focal point. Rieslings come in all shades of sweet from not sweet — as dry as you can get — all the way over to intensely sweet (but usually balanced by acidity). What you think of Riesling may be determined by your first sip and for many people that sip was uncomfortably sweet (especially if you weren’t expecting it). So Riesling (like Sherry, another misunderstood wine) is held to be guilty of criminal sweetness until proven innocent. And many consumers, convinced by what they have heard or believe, never give it a fair trial. Even worse in a way is the fact that some people who like sweeter wines are confused when they chance into a dry Riesling. Is that Riesling? Not what I expected. The opposite confusion can confront the dry Riesling fan who ends up with a bottle of off-dry to sweet wine. It isn’t always easy to tell sweet from dry from the information that you find on the bottle, although the sweetness scale created by the International Riesling Foundation (an organization that came out of the first Rendezvous meeting) certainly helps. Research presented at the conference suggests one final problem. The people who love Riesling the most (perhaps because they appreciate its diversity) apparently also appreciate the diversity of wine generally. They drink Riesling, of course, but not with the single-minded resolve of, for example, Sauvignon Blanc fans, who come back more frequently to their favorite wine than do Riesling’s core consumer group. As with Pinot Gris, the problem isn’t life threatening, just frustrating. Riesling, in fact, has been a hot wine category in the U.S., but growth has faded a bit recently and the momentum shifted elsewhere. That seems to make everyone on Planet Riesling nervous. Misunderstood Riesling. Misunderappreciated Oregon Pinot Gris. What is to be done? A further report on the discussions and perhaps the outline of a strategy in the next post. Thanks to both the Oregon Pinot Gris group and to Riesling Rendezvous for allowing us to participate. Thanks to Sue Veseth for the photos. I look forward to read next post ! Pinot Gris and Riesling overview is very interesting. I believe some of the “interest” in these wines is familiarity which you identify in the article. In addition, names matter…Their are times I think the Europeans have it right by referring to their wines by region vs. grape. Given there are over 1300 grape varieties that can produce wine, I don’t believe the average or even above average wine consumer can digest all of this detail and something like a “nice white Bordeaux” appeals to consumers more readily……Marketing does matter when position is an issrue. Interesting issue….. While lots of North American wine drinkers and the American wine culture is young, less than 200 years, the European wine culture is jusssstt a little older and has had more time to learn to experiment and appreciate a wider variety of wines. Many Americans mistake the fruit quality in a wine for sweetnes and minerality for dryness. It is difficult at times to get many American wine drinkers and experts to admit that there is more to the world than Cab, Chard , Pinot. It is also the duty of Wine writers to bring the good qualities of misunderstood wines to the public. Great post, Mike. You are spot-on regarding both consumer attitudes towards and their lack of familiarity with these varieties. 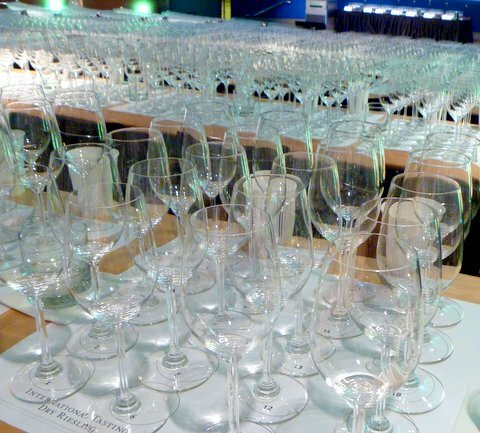 Barring a Hollywood Miracle (“Sideways, the Riesling Redux”), persistent promotional tastings and events by producers and fans are about the only known remedies. Pinot Gris is what sells, but it’s not the best white wine coming from Oregon these days — Chardonnay is. Now there’s a wine that has, from other places, been misoverappreciated and misoverpigeonholed. Some of the Oregon producers we talked with seemed to think that California has a lock on the U.S. Chardonnay market — another example of misoverpingeonholing? Pinot Gris is the best-selling white wine in Oregon, but it’s not the most delicious anymore. I’d hate to see a young wine state locked into a lesser grape. Great post Mike. I look forward to subsequent post(s) on this topic! Well done Mike….I too look forward to the post! We have the same problem with sherry in Spain. Why Porto and Marsala sell so well and sherry is misunderstood and sold as low-cost?